Originally announced on October 7th, 2013, the Pentax K-3 is the exciting new flagship 24-megapixel APS-C DSLR from Pentax which will be replacing the outgoing K-5 II and K-5 IIs models. This camera delivers numerous enhancements over the aging Pentax K-5 family of DSLRs, which was originally introduced more than three years ago, in September 2010. Targeted mainly at advanced photographers and enthusiasts, the K-3's improved key specifications are now on par with (or better than) those of the Nikon D7100, its closest competitor within the DSLR realm. The K-3 was launched with a retail price of $1299 in the US. At the heart of the Pentax K-3 is a new AA-filterless 24-megapixel Sony sensor, which promises to deliver a noticeable improvement in image quality over its 16-megapixel predecessor. The K-3 also has a quieter shutter that's twice as durable as before (now rated for 200,000 actuations), an 8.3 FPS burst mode, USB3 and UHS-I support, dual card slots, improved live view and movie modes, a new 86k-pixel metering system, an innovative on-demand antialiasing filter simulator, a 27-point autofocus system, wireless tethering support, and a larger 3.2" LCD screen with a 3:2 aspect ratio. Like the K-5, the K-3 is fully weather-sealed and has a durable magnesium alloy body. All these top-notch specs certainly make the K-3 seem like a pro-grade SLR at a semi-pro price! In this in-depth review of the Pentax K-3, we'll be taking a close look at the key aspects of this compelling camera. How good of an upgrade is it over the K-5 II and K-5 IIs, and how does it fare alongside the competition? This DSLR looks great on paper, but does it live up to our high expectations? How is the image quality? Read on to find out. 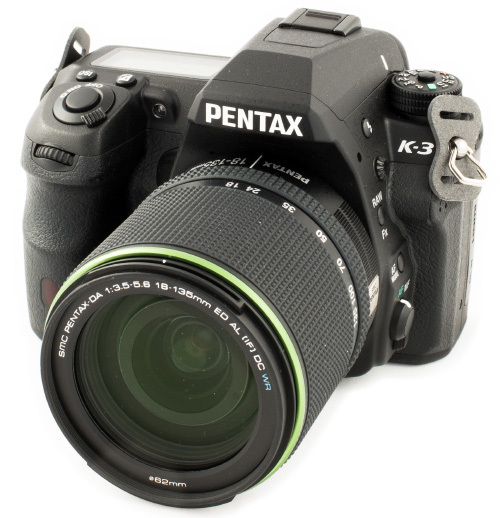 Ready to get your Pentax K-3? Click below to place an order or check current pricing.